Economists, in general, are very enthusiastic about competition. Competition is a good thing. economically. Why? Because it is efficient. And efficiency helps society make the most of its scarce resources.When the conditions are right, markets that are highly competitive force all firms to be very efficient. Competition between firms also makes the customer “king”. When firms compete, consumers ends up being the real bosses, the ones who decide what should be produced and in what quantities. Highly competitive markets are also paradoxical. Firms don’t start out with the objective of being efficient and they don’t really intend to make the consumer the “boss”. It just turns out that way. What firms really try to do, of course, is to maximize their own profits. But, if the conditions for perfect competition exist, then we get a very paradoxical result: firms are trying to maximize profits, but none of them actually make any profits. They just earn enough accounting profits (zero economic profits) to stay in business. In later units we will examine what happens when markets are less competitive, but in this unit we’re going to look at the market structure economists use as the “standard” to measure the performance of all markets: Perfect Competition. Sometimes it’s called Price Competition, sometimes Pure Competition, but it has the same result: efficiency and zero economic profits in the long-run. However, before we look at how Perfect Competition works, we need to finish a discussion we started earlier about how a firm decides how much to produce. We call this the short-run profit maximization decision. Calculate & analyze graphically the profit-maximizing output in the short-run. List the characteristics of perfect competition and give examples. Explain and show, using both tables and graphs, how firms in perfect competition determine the price and quantity that will maximize profits in the short run. Use tables and a graph to show the size of the profits or loss. Explain the dynamics of what happens in perfect competition in the long run and explain and show graphically the long run equilibrium situation. Explain the goals of productive efficiency, allocative efficiency, and incentives for innovation and how successful perfect competition is in achieving those goals. The short-run production decision: Given the long-run decision in number 1, the firm is limited in its range of choices. Basically, it can choose how much to produce. In the context of economic models, this is described as choosing what Q (quantity) of output to produce.Given that it has already committed to a certain technology (long-run decision), the choice of how much to produce dictates how much short-term, or variable costs, must be incurred. The last step isn’t really a decision, it’s a calculation of how much profit was made. In the unit on costs, we focused primarily on how costs vary when the quantity produced varies and we developed the idea of the marginal cost curve and an average total cost curve. We expanded the idea to say that any particular ATC represents a particular technology and a specific fixed cost. As a firm looks at decision #1 above, the long-run decision, it has to pick a particular technology, amount of fixed cost, and the resulting ATC from the many different technology and ATC costs that are possible. But once it selects and makes its long-run production decision, it has committed to that specific ATC curve. All that’s left to do is decide which quantity to produce. Graphically, this means the firm has chosen and committed to a particular ATC and is only now able to choose different points along that curve. The long-run production decision has been made. Now, in this unit, we can finally answer #2, #3, and #4 above. The short-run production decision, #2 above, is pretty straightforward at this point. We already have the concept of marginal cost. What we need to compare to marginal cost is some kind of marginal benefit for the firm. Since the firm sells what it produces,the marginal benefit to the firm of producing and selling another unit of output is called Marginal Revenue (MR). A firm makes a rational, marginal decision: it seeks the level of output (quantity) that will cause Marginal Revenue to be equal to Marginal Cost. In other words, a firm constantly asks itself whether it should make a little more output (or a little less). It makes marginal decisions about whether to increase Q. To decide whether to make the next unit, the firm wants to know if the next unit will be profitable. If the next unit will bring in more revenue when it is old than the unit increases costs, then the next unit is profitable. It’s MR is greater than MC. As long as the MR of the next unit is greater than the MC of the next unit, then the next unit should be made because it will add something to profits, no matter how little. Once MR < MC, then the next unit will lose money — it will reduce existing profits, not add to them. So, if MR<MC, don’t produce the next unit. 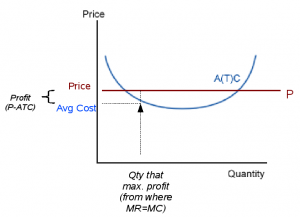 TIP: Remember this “golden rule” of profit maximization: Always produce the Q where MR=MC. 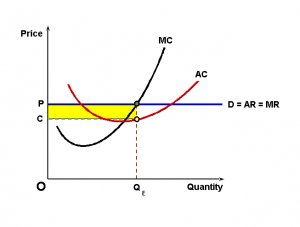 In a graph this means find the intersection of the MR curve and the MC curve, then drop down to the Q axis to find the quantity that will maximize profits in the short-run. Keep in mind, you’ve found the quantity that will maximize profits, but you haven’t yet figured how much profit exists at that point. All you know so far, is that profits at any other quantity will be less than where MR=MC. How Do We Know the Marginal Revenue? In explaining the short-run production decision above, I described Marginal Revenue as being what the revenue the firm gets for selling the next unit. I should be more precise. Technically, Marginal Revenue is the “increase in Total Revenue when the firm sells an additional unit”. However, in this unit as we study Perfect Competition, we can think of marginal revenue as being simply the price of the next unit we produce. For Perfect Competition, the Price is equal to Marginal Revenue. In other words, the firm sells all units for the same price. This won’t always be true in other market structures, but it works for the time being. TIP: Graphs of a firm in Perfect Competition have a single horizontal line at whatever is the market price. It is (or should be) labelled as both “P” and as “MR”. It is a good idea to think of this as actually being two separate curves: one shows the price at for each quantity (P) and the other shows the marginal revenue at each quantity (MR). Think of it the two curves as “just happening” to be right on top of each other in perfect competition. In monopoly and other market structures, these curves will not be on top of each other and will be more distinct. The Golden Rule of Profit Maximization, produce Q where MR=MC, tells us the quantity that will maximize profits. It does not tell us how much profit will be produced at that quantity, only that it will be more than at any other Q. To calculate how much profit is actually being earned (step #4 above), we need two different pieces of information. These pieces of information can be obtained from the graphs. They are the Price (P) and the Average Total Cost (ATC). Price is another way of saying “average revenue”. It’s what the firm collects for each unit it sells. The ATC is what, on average, each unit costs. If we look at the difference between Price and ATC, we get the “average profit per unit”. In other words, P-ATC = profit per unit. This tells us how much profit the firm is really making. If you multiply this “average profit per unit” (P-ATC) times the quantity sold (Q), you get the total profit the firm has earned. Graphically, this profit is illustrated in the graphs. Find the quantity that will maximize profits and then look at the vertical distance between the Price curve (P) and the ATC curve. This distance is the average profit per unit. If P is greater than ATC, then the firm is making a positive profit on each unit. If P is less than ATC (P curve is below ATC at this quantity), then the firm is losing money. Should a rational, profit-maximizing firm sell a product that if the firm knows it will lose money? Yes, maybe. It sounds counter intuitive, but it is indeed rational to go ahead and produce some quantity of product even when the firm knows the price is too low to make a profit. To understand this, we need to keep in mind that the decision we are analyzing is a short-run decision, and in the short-run, some costs are fixed. Remember that fixed costs must be paid in the short-run even if the firm produces zero output. If a firm shuts down in the short-run, meaning it produces Q=0, the firm will have zero revenue and zero variable costs, but it will still have fixed costs. So,at Q=0 a firm will lose money equal to its fixed costs. If the firm can produce some output and sell it at a price that is a little more than the variable cost of producing it, then the firm would get a little money to help offset those fixed costs. It would still lose money overall, but it would lose less money than if it shuts down completely. So, if P>AVC, then it still makes sense to produce at Q where MR=MC, even if P < ATC. How Does A Firm Choose What Price To Charge? Earlier, I described this as decision #3: What price to charge? Although the logic all firms use to maximize profits is the same, what price each firm can charge (and therefore marginal revenue) depends on how competitive the market is. Therefore, competition affects profits. But markets vary considerably in how competitive they are.For example, some markets are extremely competitive, with firms unable to make much, if any, profits. Other markets are dominated by only a few, or even just one, firm. A firm’s ability to pick prices depends on what market structure it is in. It’s useful to think about these four market structures as different locations on a spectrum. Imagine a spectrum of “competitiveness”. At the moment we haven’t defined “competitiveness”, but imagine a spectrum such as shown below that runs from extremely competitive, where there are lots of competitors intensely fighting each other and very evenly matched, to completely uncompetitive. In the completely uncompetitive situation, there’s absolutely no competition between firms because there’s only one firm. There’s not even the threat of a record firm starting up. Pure Price Competition is what economists call the theoretical case of complete and intense competition. Some economists use the term Perfect Competition for pure price competition. At the other end, Monopoly is the theoretical result of having absolutely no competition – the other end of the spectrum. In the real world, very few markets or industries truly meet all the conditions of “perfect competition” or of “monopoly”. In fact, no real world industry or market is “perfectly competitive”. Perfect competition is only an idealized hypothetical situation intended to focus attention on the socially beneficial effects of competition. In the real world, most markets and industries are in between these two. They have varying degrees of competition. If the market has a lot of competition, but not quite as much as the theoretical ideal of “perfect competition”, we call it “monopolistic competition”. It’s competition, but it’s just to the monopolistic side of perfect competition. Some books call this “imperfect competition”. In some situations, the number of competitors gets very small – approaching one, but not quite. This is called an oligopoly. It’s perhaps the most interesting for economists to research because it’s the most unpredictable. In this unit we start with the ideal of a perfectly competitive market. In the next unit we jump to the polar opposite: monopoly. After that we examine the two in-between cases. It’s these somewhat competitive situations, the in-between cases of Monopolistic Competition and Oligopoly that you and I most likely encounter in the real world, but to understand them, we need to look at the theoretical extremes. When Does Perfect Competition Exist? Perfect Competition is an abstract, theoretical model of a market structure. In the real world, there aren’t any true, fully perfect competition markets. However, there are markets that tend to come close. Four conditions create Perfect Competition. Often these conditions are called the characteristics or assumptions of perfect (pure price) competition model. First, there are so many small producers (firms), that none of them has any significant influence on market pricing. For example, imagine a small farmer (somebody whose farm is small, not necessarily that they are short!). The market for corn in the United States is so huge, that the market equilibrium price won’t change, regardless of whether this particular farmer decides to grow another acre of corn or not. This condition of each firm being so small that they are insignificant relative to the market is what makes the MR curve horizontal or perfectly elastic. Each firm can produce what seems to them like a much large quantity of output, but it really isn’t much more compared to the market. As a result, the additional output the firm produces can be sold at the same price as smaller quantities of output. Second, imagine a market where all firms are selling absolutely identical products produced in exactly the same way. For example, if you buy a share of stock in General Motors Corp, it doesn’t matter who you buy it from – each share is exactly the same as another. When all firms make products that are essentially identical, they are called homogeneous products. The assumption of homogeneous products is important. It means that all firms will be selling their products at the same price. If all firms’ products are identical to each other, then customers can only choose between firms by choosing the lowest price. Any firm with a slightly higher price loses all of its customers. Thirdly, in perfect competition, there are no barriers to entry or exit. This means new firms can easily and quickly get into the industry, as well as existing firms can easily quit. We’ll see that in the long-run, this is an important condition. As a result of no barriers to entry or exit, the industry will, in the long-run, not make any economic profits at all. Finally, some books ignore an important fourth condition or assumption of perfect competition. I summarize it as no secrets allowed, but some economists call it “perfect information”. This condition means that if a firm discovers a new, lower cost way of producing they can’t keep it a secret. All the other firms will copy the innovation. As a result, all firms have essentially the same cost curves. Similarly, no firm is able to fool or cheat customers either. In the short-run, all the many small firms are at the mercy of the market price. Total market supply and demand sets a market price and each firm sells at the market price or it doesn’t sell at all. Each firm then uses this price (which is also their marginal revenue) to decide what quantity to produce (Q) using the MR=MC logic previously described. Then each firm calculates how much profit it earned. If the market price is high enough, then it is possible each firm might be making a positive profit. It so, each firm is probably happy with the outcome — after the goal of the firm is make profits. But the existence of economic profits among the firms in this industry acts like a big red flag to all the firms and entrepreneurs outside this market/industry. Firms outside this industry see the economic profits and want to get some too. So these outside firms enter the market,When new firms enter the market, it expands the number of firms in the market and shifts the market supply curve to the right, lowering the market price. With the market price now lower, all the firms in the industry must now re-calculate what quantity to produce (where MR=MC), and then re-calculate how much profit they made. The outcome of having these conditions, combined with firms making rational profit-maximizing decisions, has an interesting result. As long as these three conditions hold true, then by having all firms try to maximize their own profits, none of them will make any profit in the long run. 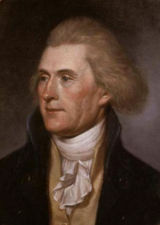 Even more significant, is that each firm will be led to produce the product as cheaply and efficiently as it knows how. Not because it wants to, but because that’s how to maximize profits in the short run. Unfortunately for the firms, but fortunately for consumers, those short-run profits attract new competitors. New competitors don’t have any way to sell in the industry unless the cut the price to attract customers. The existing firms then have to follow the price cut (the products are all identical, remember). And there go the profits. The price competition and new entry of firms keeps all the firms from making long-run economic profits. Perfect competition is the standard by which economists evaluate the performance of all other market structures. Perfect competition, price competition, is efficient.Customers end up getting products made at the lowest possible cost for the lowest price.In the long-run, firms don’t make any economic profits — they make only enough accounting profit to keep them in business. Needless to say, firms aren’t too happy about perfect competition. Who wants to work that hard and then not make economic profits? Most firms, if it is possible, will avoid competing on price in perfect competition with other small firms who make identical products. In the next few units we will study the other market structures in which firms try to avoid competing on price alone. and the worst in people.